ATD provides testing, certification, registration, support, and insurance for members who volunteer with dogs to visit hospitals, special needs centers, schools, nursing homes, and other facilities. We’re a network of caring volunteers who are willing to share our special canines to bring smiles and joy to people, young and old alike. 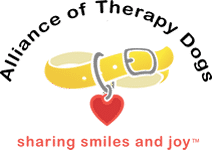 Whether you and your dog are looking to become a certified therapy team or your facility would like to start a therapy dog program, Alliance of Therapy Dogs (ATD) is your #1 choice for pet therapy. Join our family of friendly dogs and owners and handlers who share with those who are unable to own a pet or are in a health facility separated or away from their pets. Would you like to help others experience the fulfillment you feel when you take your dog on a pet therapy visit? Take the concept of “Sharing Smiles and Joy” to new heights by becoming an ATD Tester/Observer.